Back in July of 2015, LeBron James signed a business partnership deal with Warner Bros. which automatically sparked a bunch of rumors of a Space Jam sequel. Since the film has been rumored to be nearing a pre-production phase since 1998, I still didn’t think a sequel was going to happen. Well, on May 2nd of 2016, THR announced that Fast & Furious 6 and Star Trek Beyond director Justin Lin will be directing LeBron in the long-awaited sequel to the cult favorite. The script will be written by Lin and writing partner Andrew Dodge and I’m sure Michael Jordan fans will not approve of any draft. You can read all about the not-so-great history of Space Jam, how Michael Jordan hated making it and the sequel rumors here and view a brief timeline of the rumors below. Jordan reportedly was approached about doing a sequel with Mel Brooks as the bad guy and MJ didn’t want anything to do with it. Famous artist Bob Camp was in the process of creating concept art for the film. 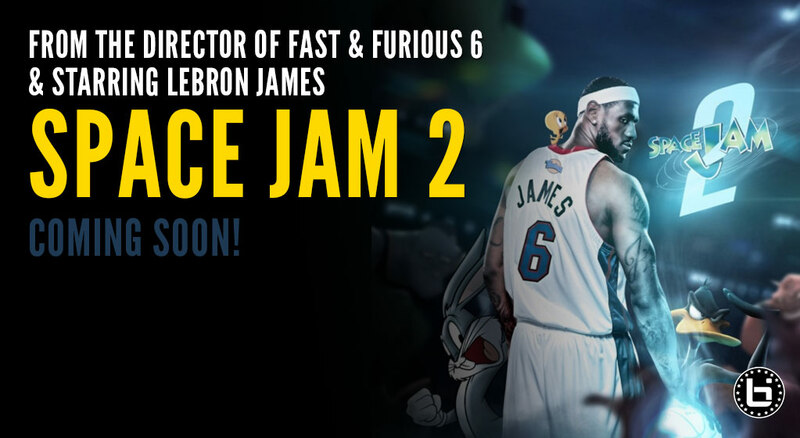 Scoop Jackson reports the first rumor that Space Jam 2 is being made with LeBron James. Under it’s Warner Bros Premier division, Warner Bros was planning on releasing a direct to video sequel along with 15 other sequels and prequels. Most of these, including a Beetlejuice and Goonies sequel were never released. News is released that Kevin Durant has agreed to star in an upcoming basketball film for Warner Bros. Many speculated that it was the sequel to Space Jam but the film ended up being “Thunderstruck.” The film grossed $587k in the theaters and was released on DVD a month later. Thunderstruck grossed less money in the theaters than Space Jam did during matinee showings on opening day. Deadline releases news that Warner Bros is willing to produce and script a Space Jam sequel FOR LeBron James. LeBron’s “camp” says they are not in discussion with Warner Bros.
Warner Bros renews trademarks on Space Jam in June and announces deal with LeBron James in July. The Hollywood Reporter announces Justin Lin will write and direct a sequel with LeBron James as the star.